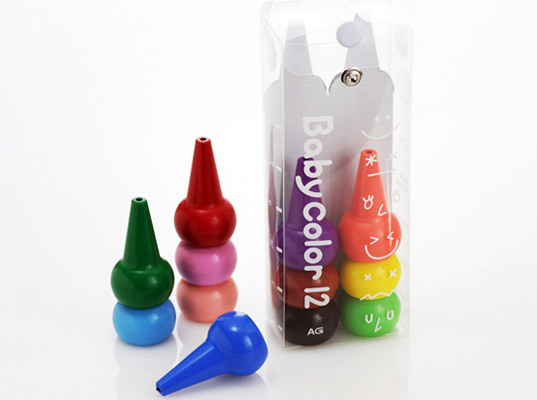 Tiny hands don’t always know what to make of stick-shaped crayons, which makes the nasal-bulb-like shape of these Baby Color crayons totally genius (even if they make you think of snot). The perfect size for mite-size mitts — and large enough not to accidentally swallow — these all-natural, vegetable-based crayons come with pointed tips that offer the precision of regular coloring tools. Another bit of brilliance: they can be stacked on top on one another, which means that they also double as toys. We have a set of these and I have to say that I've been disappointed with them - the tips break off fairly easily, and the depth of colour on paper is quite anemic (not nearly as rich as regular crayons), unfortunately. Even pressing really hard and going over and over on the paper, it still looks washed-out. Tiny hands don't always know what to make of stick-shaped crayons, which makes the nasal-bulb-like shape of these Baby Color crayons totally genius (even if they make you think of snot). The perfect size for mite-size mitts � and large enough not to accidentally swallow � these all-natural, vegetable-based crayons come with pointed tips that offer the precision of regular coloring tools. Another bit of brilliance: they can be stacked on top on one another, which means that they also double as toys.